The romance of the truck stop may sound like worn-out material for an artist to draw on. The idea would seem to evoke a familiar landscape ¬- one that is, let’s face it, from the last century. In Air Cushioned Ride (2007) the Berlin-based Albanian artist Sala makes the territory his own. 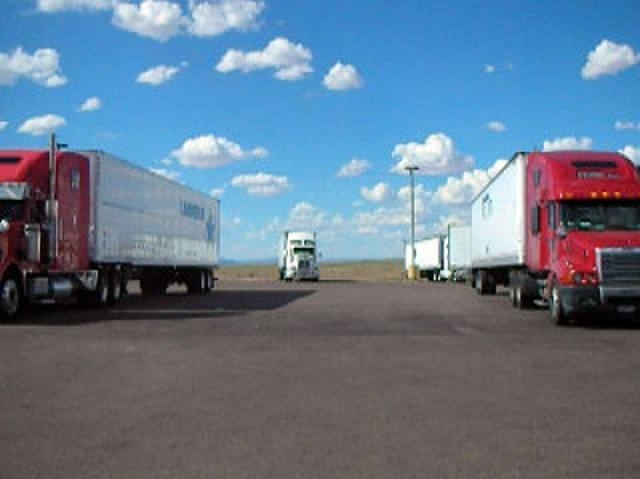 A car-mounted camera slowly circles a row of 18-wheel vehicles, a scene that is set against the dazzling blue big sky of some nameless open country. Along for the ride is a soundtrack that alternates between two songs, on a country music and a classical music station, respectively. For the show’s opening, Sala had this composite tune arranged for live performance. Producing a full-bodied replication of the work’s soundtrack was a combined and rather large group of authentic-looking country/western and classical musicians. It was a novel accomplishment and something of a technical feat. What it added to the piece as a whole is less certain. The artfulness of the adaptation is its weak point proving that, in conceptual practice at least, antipathy to technique remains steadfast. Sala’s film, on the other hand, is entirely artless and so that much more successful. Initial assumptions about the time and place of the work give way to the realization that the scene you are looking at is not necessarily in the proverbial mid-western US. Country music and long-distance trucking are Americanisms that are at this point merely part of the general condition of things in the West. It is this fusion of old world and new that the artist neatly encapsulates on his soundtrack. By articulating an idea about the universality of placelessness, Sala achieves an absolute contemporaneity. Bypassing the easy clichés of pop culture, he carves out a concrete piece of the present. You are currently browsing entries tagged with Air Cushioned Ride at Army of YouTube.